When you first dip your toes into the homeschool world, you’ll quickly realize that there are these things called homeschool styles. It can be a little intimidating at first. You have no idea who the heck Charlotte Mason is, didn’t even know unschooling was a word, and classical homeschooling sounds SOOO intimidating! Eventually you find your tribe, the ones who understand your homeschool language and why you do what you do. But one homeschool style you probably won’t hear much about is relaxed homeschooling, and that’s because it is the hardest homeschool style to actually define. In fact, relaxed homeschooling is often not acknowledged as a legitimate homeschool style at all. Now, I’m far from an expert (in homeschooling or education), and while I may have a master’s degree in guidance counseling, that required all of one measly class in education (ED100). The one thing I do have is a thirst for knowledge that is only filled by reading: lots and lots of reading. When I first started homeschooling, I gobbled up everything I could get my hands on regarding homeschool philosophies, approaches, and styles in order to know the “why” behind my methods and my choices. I’m going on year four of homeschooling now and have finally planted my feet firmly in the relaxed homeschooling camp. Funny thing is, very few people write about or both to define relaxed homeschooling at all. There are literally two books on the subject: TWO. 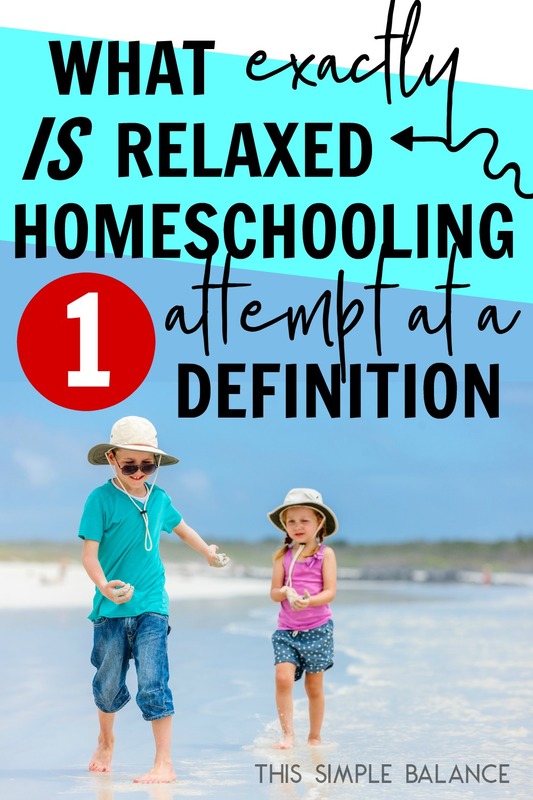 Given the sad lack of information and resources for relaxed homeschoolers or those interested in this homeschool style, I am attempting to explain and define relaxed homeschooling. The terms relaxed homeschooling and eclectic homeschooling are sometimes used interchangeably, but they are not always the same. 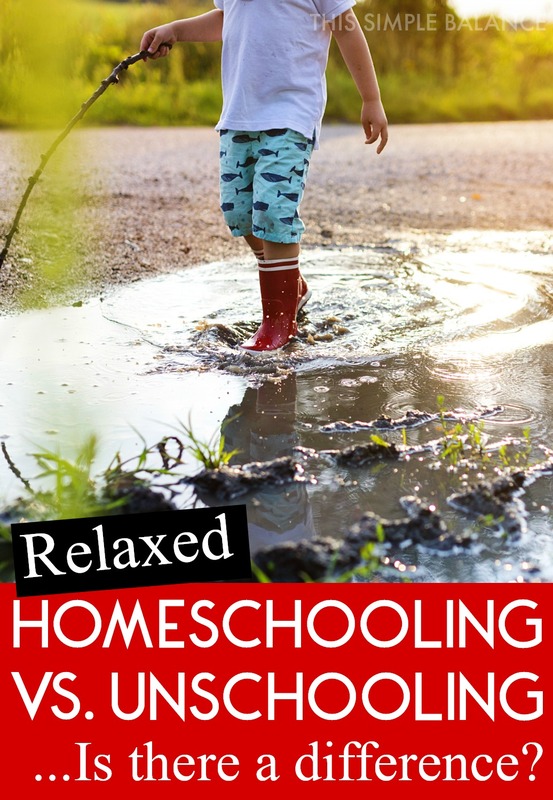 Relaxed homeschoolers can lead toward a specific homeschool style (Charlotte Mason or classical, for example) and don’t always use a variety of approaches in their homeschool. It is also possible for an eclectic homeschooler to be anything BUT relaxed. Variety does not a relaxed homeschooler make. The most common misconception I come across about relaxed homeschooling is that it’s pretty much the same as unschooling. Now, relaxed homeschoolers often draw inspiration and methods from the unschooling movement, and the two can look similar from the outside, but if you dig deeper, a single critical difference sets them [far] apart. When you consider how often you hear homeschoolers claim to love “unschooling”, it may come as a surprise that radical unschoolers scoff at this misunderstanding of their homeschool style. In fact, they created the term “radical unschooling” just to set themselves apart from others who use the term so loosely. At the heart of the differences between unschooling and relaxed homeschooling is this question: who is in charge of the child’s education – the parent or the child? Relaxed Homeschooling: The parent directs the child’s education. In all of my reading, relaxed homeschooling parents always assume some level of control over their child’s education. Some perceive it as a partnership between parent and child, but at the end of the day, the parent is the bottom-line decision maker, the one who plans, directs, and guides the child’s education. Do relaxed homeschoolers take into account their child’s interests and learning styles? Absolutely. Are they far more laid-back than their “school at home” counterparts? Yes. Do they use unconventional and creative teaching methods? Probably. But at the end of the day, the vast majority of relaxed homeschool parents believe that certain knowledge is essential, and they will not leave it up to chance that the child will see it the same way. What knowledge is considered essential and what is not does vary from parent to parent. One relaxed homeschooler may view elementary school science as essential, while another may consider it a waste of time (they reteach it all in high school, anyway). That parent probably sticks with nature studies and science documentaries and calls it a day. One relaxed homeschooler may view certain “classics” as valuable and necessary, while another simply wants her child to love reading. Therefore, she probably won’t require reading the classic novel on all the book lists just because someone at some point in history decided to designate it a “classic”. Ultimately, 99% of relaxed homeschoolers agree that there are things their child needs to know, things that are a critical part of his education. They just happen to rely far less on formal curriculum and traditional methods to help their child acquire that knowledge. Unschooling: The child directs his own education. In contrast to relaxed homeschoolers, unschooling parents place full trust in their child to determine what knowledge she does and doesn’t need. Contrary to common perceptions of radical unschooling, unschooling parents do spend time teaching their children. If a child asks how to read, an unschooling parent will certainly teach him. 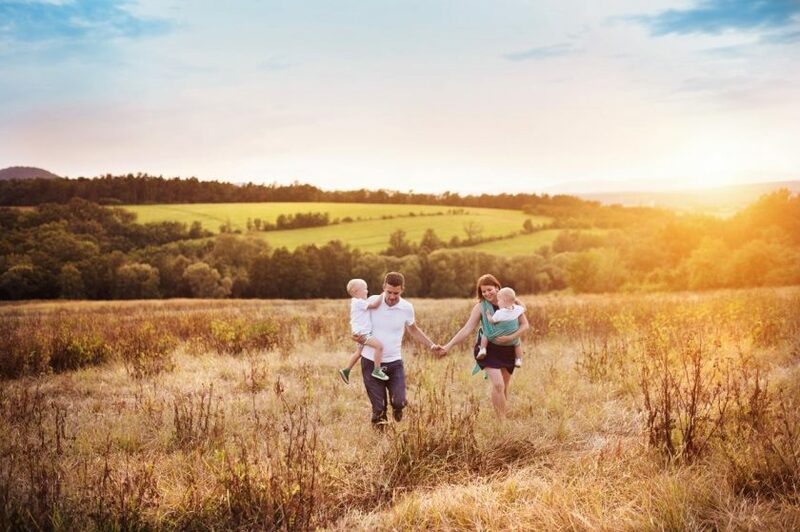 They also spend a lot of their time and energy exposing their children to the world and bringing home resources they think might pique their interest (a practice often referred to as “strewing”). Just like relaxed homeschoolers, unschooling families frequent the library, take lots of field trips to zoos and museums and aquariums and historical monuments, and might even (gasp!) buy curriculum if it’s necessary to satisfy an interest or curiosity or answer an ongoing series of questions. Unschoolers can sometimes put more hours into their child’s education than traditional homeschooolers because they work hard to answer their child’s questions in the moment and can spend a lot of time looking for the perfect resource to match her current interest. Unschoolers have a “complete trust in their child’s ability to learn”. The parent serves as a resource, mentor, and guide, but at the end of the day, the child directs her own education every step of the way. You can think about relaxed homeschooling as a sliding scale, with one end of the scale being an unschooling approach and the other end being school at home approach. There is a LOT of room for differences on that scale, as is the case with almost any homeschool style. Few purists exist in the homeschool world. Nearly every relaxed homeschooler I have come across in my research values interest-led learning and believes that children are hard-wired to learn. These are both core tenets of unschooling. At the same time, I have yet to come across a relaxed homeschooler who does not determine the course of their child’s education (even if that’s not apparent to the child himself <wink>). Now we circle back to the original question I set out to answer: what exactly is relaxed homeschooling? You can see why it’s so hard to answer that question. Because this term is so broad and used so loosely, it’s impossible for every relaxed homeschooler to agree on a single definition. However, I did find one definition that resonated with me the most: “Relaxed homeschooling focuses on preparing a child to fulfill his unique purpose in life, not preparing a student for college or a job” (source). I love this definition because it leaves room for each child’s education to be unique, for an education to include all kinds of learning, and to address the needs of the whole child (not just their minds). But I don’t think that definition is complete. Using that definition as a starting point, I came up with my own working definition of relaxed homeschooling. So there you have it – my attempt to define relaxed homeschooling. Do you agree with my definition? How would you define relaxed homeschooling? Interesting. I’ve never looked at these definitions before ( my kids are now 14 and 12- been doing this a few years) because honestly- who cares? Just do what you do you don’t need to label it. 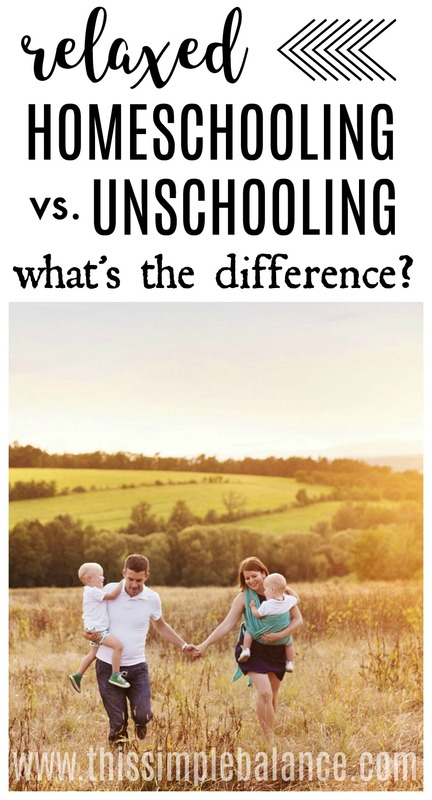 I’m think though, that by your definition of unschooling being 100% child lead, worldschooling of any kind must never be unschooling because the parent is deciding which countries the child will visit and therefore learn about. I know I take my kids to places I want them to know about and consider important. Yet so many “worldschoolers” also consider themselves unschoolers. Just an interesting thing…doesn’t apply to me. I always just say we homeschool because that’s what you have to be registered as in Oz. Dont like the un or world terms much . Thanks for sharing your thoughts Alyson! I stumbled across your post and thought you did an excellent job of explaining my method too, relaxed homeschooling. It was a bonus to notice that my book came up as the suggested reading. 🙂 Think Outside the Classroom. I have loved the relaxed method and you’re right, it’s difficult to define. And we change from one year to the next, depending on each child and season. But I think at the heart of it, for me, is trusting that God gave our children what they need to learn what they need to learn when they need it, if they are provided with a an environment conducive to learning. And remembering that what a child isn’t really motivated to learn probably won’t stick anyway. And how to make the important things relevant. Hi Kelly! So cool that you came across my post, especially since I loved your book. 🙂 There aren’t enough books written on relaxed homeschooling, that’s for sure. It definitely requires a lot of trust, trust that you know your children, trusting God that what you’re doing is enough and the right thing, and trusting that He’ll make up whatever their education lacks. And I absolutely agree that whatever they aren’t motivated to learn probably won’t stick! Thank you so much for this post. I’ve been homeschooling for 6 years and have been feeling I need to change some things. I like a few concepts of unschooling, but not the whole thing, and I felt there had to be a happy medium somewhere and relaxed homeschooling is it! I was homeschooled from 8th grade until I graduated. My mom wasn’t able to buy us any curriculum, so she did the best she could, and a lot of my time was more like relaxed homeschooling. I thrived in that atmosphere where I could learn based on my interests, but with some guidance from my mom. I showed a lot of interest in writing, so she asked a friend to be my English tutor. Mentoring in that way was a great way for me to learn. So, I guess this is what I want our homeschooling to look like. I’m so glad you’re writing about it and I’d love to see more about how you do it. I’m finding it so hard to let go of the traditional worksheet model because it’s measurable. But it’s also boring! Thank you for this comment. I’m exactly in the same space! On some undefined place on the sliding scale ?and it’s usually so hard to explain to people, especially those who don’t homeschool. Thank you so much for this post! I have been searching for a definition for what I do schooling wise. It seems as though every homeschool moms first question upon meeting me is “what curriculium do you use?”. Followed by me feeling like a horrible mom since I have never found one I like and don’t plan to use one anytime soon. But when I step back and look at my kids they are thriving. I want them to love learning not feel like it’s a chore. Again thank you so much for this post! Ooh, I like this. Although I appreciate some things about un schooling, I do NOT trust my child to know what they need to know. I’ve been a kid. I was a smart kid, but I took the path of least resistance always and have some serious gaps because of it. I trust my kids to do the same! I’m more interested in making the things they need to know but aren’t naturally drawn to fun and appealing. Thanks for a great post!! !